Properties in Kuala Lumpur average 4.1 out of 5 stars. 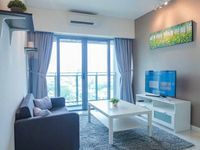 Property 8: Bukit Bintang 1 Bedroom Luxurious Home For 4 pax. Property 10: Bukit Bintang 2 Bedrooms Luxurious Home For 6 pax. 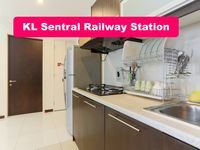 Property 46: Bukit Bintang 1 Bedroom Luxurious Home For 4 pax. Host was fast to response, good area. 5 mins walk to bukit nanas monorail, 10 mins walk to KLCC. Host was fast to response, good area. 5 mins walk to bukit nanas monorail, 10 mins walk to KLCC. Very comfortable to stay there here. Definitely would love to stay here again. Very clean and modern apartment. Hostess goes out of her way to make you feel welcome and provides an extensive review of nearby highlights, transportation etc. Lovely infinity pool on the roof. Unfortunately, during our stay we lost electric power for about 8 hours and internet for over 24 hours(not our hosts fault). Although there are shopping plazas nearby, they are extremely difficult to access by foot, as Kuala Lumpur is not a pedestrian friendly city. Fortunately, Uber and Grab Car are very easy to obtain and quite inexpensive.